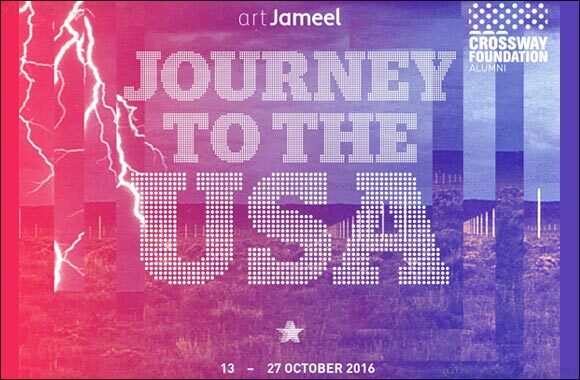 Dubai, UAE, September 27, 2016: The Crossway Foundation and Art Jameel are pleased to announce their latest project: Journey to the USA 2016. This is the latest in a series of collaborative initiatives to give young artists from the Middle East region the opportunity to work and travel across international borders. The Crossway Foundation and Art Jameel have a long-standing and successful partnership having worked on five journeys together since 2013 in Turkey, Japan, Spain, Brazil and the United Kingdom. The ten participants were selected from over 100 Crossway Foundation alumni following an Open Call this summer. They are: Ahaad Alamoudi, 24, Saudi Arabia; Najd Altaher, 23, Kuwait; Mohammed Al Kindi, 24, Oman; Nasser Alzayani, 25, Bahrain; Majid Angawi, 23, Saudi Arabia; Rawan Alhusaini, 26, Bahrain; Basmah Felemban, 22, Saudi Arabia; Tyma Hezam, 21, Saudi Arabia; Tulip Hazbar, Syria, 26; Marouan Omara, 29, Egypt; and Alizeb Raees, 27, Pakistan. The selected group will travel to the Southwest USA from 13 – 27 October 2016 to collaborate with local arts and social organisations in Texas and New Mexico. The itinerary includes a visit to Marfa, a desert city in far West Texas that became an art hub when minimalist artist Donald Judd moved there in the 1970s; an intensive two-day workshop focusing on border issues with local students at the University of Texas at El Paso; experiencing life on a working ranch in Magdalena, New Mexico; and an immersive stay at Walter de Maria’s iconic land art work, The Lightning Field, in Catron County, New Mexico. “Artists thrive when introduced to new places and experiences. There’s nothing quite like the power of crossing borders – real and imagined – to help identify the commonalities and differences across cultures and stimulate their thinking and creativity. Follow the hashtag #JOURNEYTOTHEUSA2016 for updates.